Last week I had the wonderful opportunity to travel to our nation’s capital. I was there for the U.S. Meat Export Federation Board of Directors Meeting. Everything about the meeting was great – the information presented, the networking, the hotel, the food… The group was as professional and amitious as could be regarding the exportation of beef, pork, and lamb. I was extremely impressed! However, as well as my presentation about CommonGound went, and as beneficial as the professional relationship building may have been, the stand-out event for the trip was the first leg of my air travel to D.C. I, the beef producing, poultry disliking, red meat eating, dirt farming, protestant girl from Nebraska got seated beside a philosophy and environmental ethics college instructor who was a lifetime vegetarian and Buddhist. Cool!!!! I can imagine, this is the time many farmers would have taken out the ipod, inserted the headphones and pretended to be asleep. Not me – here was my chance to learn and listen and defend! Game on! We talked about everything from why cows are on pasture part of the year and not all year to feedlot nutrition and health. We talked about GMO’s, different tillage practices, hormones, antibiotics, economics, a touch of scripture, and her teaching methods. By the time we reached Detroit from Omaha, she had taken my card to contact me to sit on a discussion panel in her class and I was really thankful I had listened as much or more than I talked. I appreciated her maturity and respect for differences among people. Neither of us tried to convince the other they were wrong. I felt this woman made a great point in that everyone needs to be able to back up their beliefs and values. Interpretation can be different for different folks and that’s o.k. – but be able to justify your particular interpretation. Too bad more of the world doesn’t think that way. As we stood to gather our carry-on items and deboard the plane, the gentlemen infront of me turned around and asked if I had sold her some beef. Of course, I had not, but I also told her that I would not deplete the tofu supply on her grocery shelf. When we got inside, I found out the man in the seat ahead of me sells livestock insurance and he was thrilled I got seated where I did – he always gets to sit by the vegetarian when he flies. HA – Luck of the draw; I was the winner this time! May and June mark the beginning of breeding season for many cow-calf ranchers; I think when Kaydee was little and watched Bambi several hundred times, we liked to use the work “twitter-pated” for animals in the springtime. Our intended “turn-out” date is sometime in the next week. How’s that for preciseness? For those of you who are not ranchers, “turn-out” is when the bulls get to join the cows and start making next year’s calf crop. Once in a while, a bull will get a bit over-zealous and really want some activity before we want him to join the ladies of the herd. 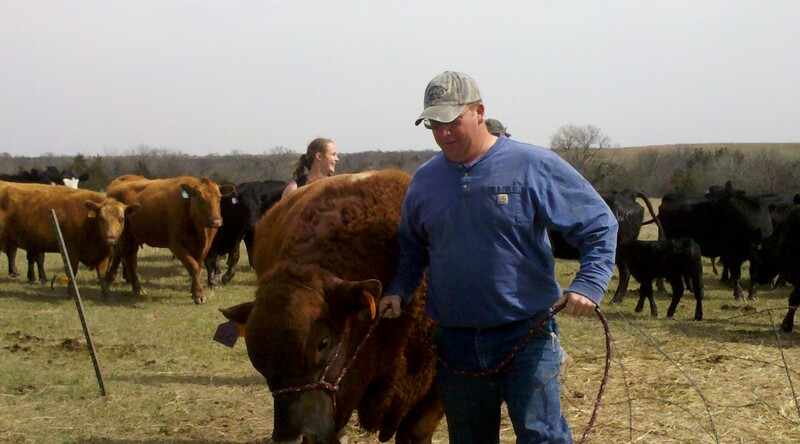 One of our bulls got out with the cows the day we gave spring shots to the calves. 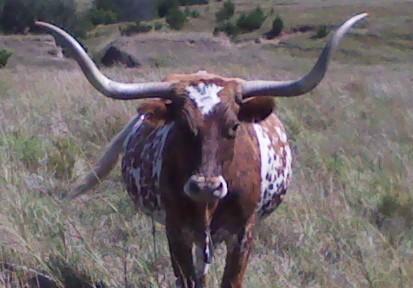 Luckily, he is a former show bull and he is VERY tame. Kaydee just walked out to him while he was busy sniffing a cow and put a halter on him. Here is Matt leading him out of the pasture and up the road, back to his confinment area until sometime later this week. Our scheduled calving time is from March 1 thru mid to later April. The closer we can get that time frame to 45 days, the more uniform the calves will be in size when it is time to market them. You might also be thinking to yourself, don’t they have some kind of a schedule for this week? How hard is it to pick a certain day and put the bulls with the cows? Well, yes, we try to make a schedule, but mother nature changes our plans for us sometimes. Three of our pastures are on dirt roads and they have to be dry for us to get the bulls to the gate. Considering the rains that came this morning, it will be a couple days before we can make it down those roads with anything but a 4-wheeler. 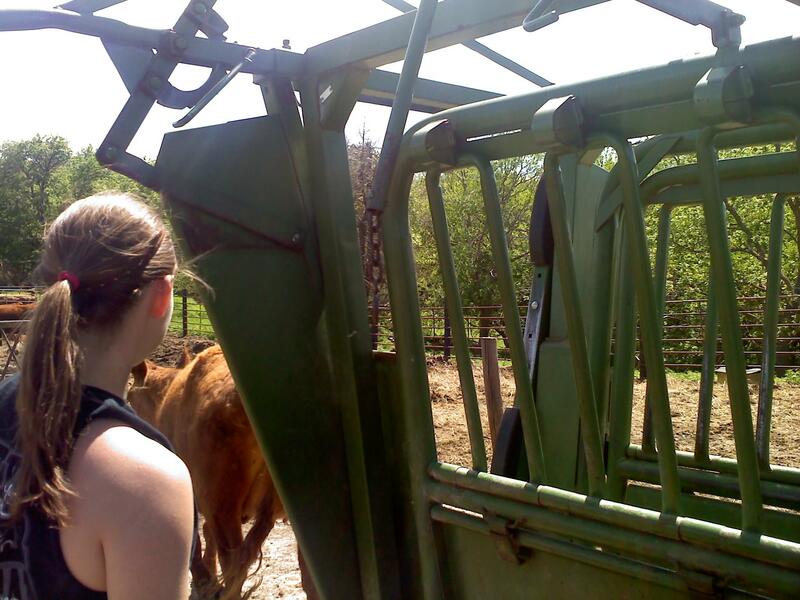 The kids’ cows get treated very carefully thru breeding season. In fact, we want them to calve as close together as possible. So, we synchronize them. The process of synchronizing cows is somewhat like a fertility program for women. We use a product to keep the cows from cycling for a period of time, remove that product, and give an injection to make them all cycle together. 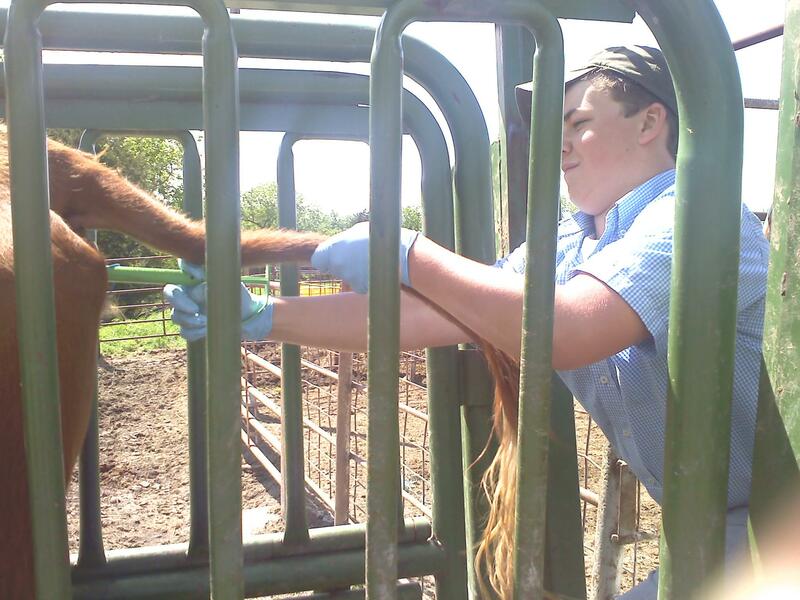 Kaydee and Emmet do all of the work for this – on Sunday, Kaydee was running the chute and Emmet was inserting the CIDR’s (for you ladies out there that are trying to picture this, it’s kind of like an IUD for cows). We will remove the CIDR’s and get ready to breed this coming weekend. Hope we have nice weather for it! Sometimes, especially when I am struggling with what to fix for supper, I realize that when it comes to food choices, we are an extremely spoiled (or blessed) society. We have thousands of choices staring us in the face from the shelves of the grocery store. Do we need cereal that comes in every shape, size, color and sugar level? Probably not, but most of them sure taste good! I know we don’t need peanutbutter and jelly mixed up in the same container & I’m pretty certain that we could all live without a couple hundred kinds of crackers and cookies. But, we are buying them because they are there, screaming out to us with their fancy packaging and strategic shelf placement. Marketing and free enterprise are one of the wonderful privileges of living in these great United States of America. There are countries where the stores are much smaller – or nonexistent and replaced with roadside stands. Raw meats, vegetables, and grains are the available purchases and one has to cook totally from scratch (or “scrap” as Emmet used to say when he was really little) . Our society operates at a pace that is not conducive to cooking from raw ingredients – we would much rather have beans that don’t have to be soaked and vegetables that can be steamed right in the bag. Meat is the one thing we seem to be willing to cook. Probably because there is nothing better than a fresh grilled something – you name it; burger, steak, pork loin, heck, I’ll even contend that chicken breast off the grill is o.k. Once again, though, we are spoiled with all of the wonderful cuts of meat to choose from. Yep, blessed! As you stroll (or hurry as I usually do) through the grocery store, just take a minute to consider….what if? What if we didn’t have all of those choices? What would I fix for supper? How would my kids get by without Nutella, and how would I make grape salad without Cool Whip? Many thanks to all of the farmers and food science guru’s around the world who continue to supply us with more than an abundance of safe, nutritious, affordable, and very creative food! Now – what to have with the roast we put in the crockpot this morning???? How would you picture a school farmyard? Maybe a cute little barn, some chickens, a goat or two, and yes, definitely a bucket calf and some ducks! Sandy Creek FFA is starting Rising Sun Produce, but it will not be the picturesque little scene you just envisioned. They will NOT have chickens, bucket calves, or ducks. Somehow I think there may be a goat somewhere in the future. They WILL have strawberries, raspberries, tomatoes, peppers, lavendar, cilantro, parsley, melons, pumpkins, and other yummy stuff. I can see it now; every kid who refuses to help their mom with a garden will have a blast with their friends at the FFA farm. Moms just aren’t as fun to pull weeds with as friends are. So, that fence building crew I talked about a few days ago? The productivity possibilities are dwindling! School is encroaching into the summer productivity space. Obviously there will be some time spent on the FFA farmer’s market effort and vineyard; then, there is volleyball – with weights and conditioning and camps; football – with weights, conditioning and camps; and basketball – with weights, shooting practice, and camps. Add in Driver’s Ed. and that MAY leave a couple good days per week for Kaydee & Emmet to earn some money. So much for just hanging out at the pool and baseball field for our kids. I remember as a youngster having plenty of time to play in the sprinkler (we lived too far from town to go to the pool) and go fishing and spend all night playing softball. I really hope Kaydee and Emmet enjoy how they choose to spend their time this summer. Since we don’t live in town, the kids’ early morning workouts are good for the body and for socializing. And, I REALLY hope we make time to go fishing at least a couple times this summer; catch and release, of course! Who wants to ruin a fun, relaxing evening of fishing by having to clean them? Not me! A perfect Sunday night supper! Emmet loves eating and he really enjoys grilling. He is a growing teenager and definitely keeps the grocery tab running! Here is a recipe that he intends to make for us later this week (probably Saturday; I think that’s the next time we all get to be together for a meal). I can’t wait! Tonight we had enchiladas at Kaydee’s request and there is one serving of leftovers for lunch tomorrow. I’ll report back if we love this meal as much…I bet we will! And…take note of the nutrient specs at the bottom – right there is every good reason to indulge and enjoy. Bring vinegar to a boil in small saucepan. Reduce heat; simmer about 3 minutes or until reduced by half. Set aside. Soak two 10-inch bamboo skewers in water 10 minutes; drain. Thread onion wedges onto skewers. Brush onions and cut sides of squash with oil; sprinkle with remaining teaspoon garlic-pepper seasoning. 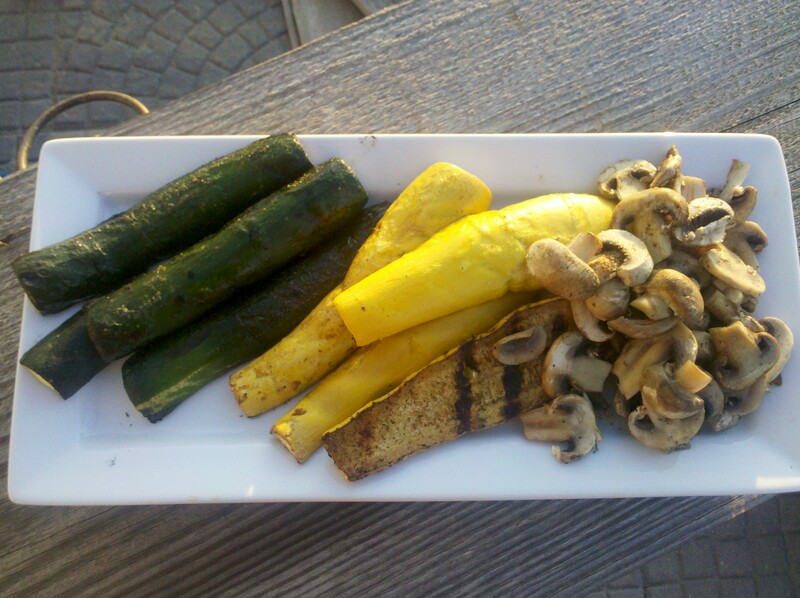 Place steaks on grid over medium, ash-covered coals; arrange vegetables around steaks. 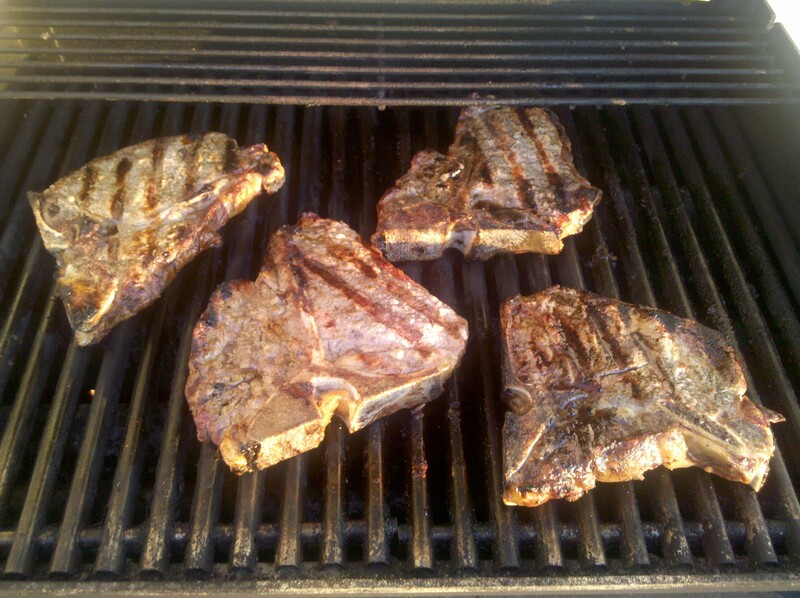 Grill steaks, covered, 11 to 14 minutes (over medium heat on preheated gas grill, 11 to 15 minutes) for medium rare (145°F) to medium doneness (160°F), turning occasionally. Grill squash 8 to 12 minutes (7 to 11 minutes for gas) and onions 12 to 15 minutes (13 to 16 minutes for gas) or until tender, turning occasionally. Remove onions from skewers; toss reduced vinegar, oregano and salt, as desired. Carve steaks into slices. Serve with onion mixture and squash; season steak and squash with salt, as desired. Nutrition information per serving: 225 calories; 10 g fat (3 g saturated fat; 5 g monounsaturated fat); 56 mg cholesterol; 271 mg sodium; 7 g carbohydrate; 2 g fiber; 26 g protein; 7.6 mg niacin; 0.8 mg vitamin B6; 1.4 mcg vitamin B12; 2.1 mg iron; 29.2 mcg selenium; 4.9 mg zinc.This recipe is an excellent source of protein, niacin, vitamin B6, vitamin B12, selenium and zinc; and a good source of iron.